The Marantz SR6001 has plenty in common with the high-end SR7001 receiver we reviewed in our March issue. The design team may have spent less on connectivity, but from the front, it looks identical to its bigger brother (apart from the missing THX logo). The model's power output is a respectable 100W to each of its seven channels, and Audyssey's automated Room Acoustic Calibration/MultEQ facility tunes the amp to your speaker system and room acoustic for the optimum performance in up to six different seating positions. Its multi-room capabilities aren't quite as impressive as its bigger brother's, but a second zone facility is available so long as you're happy to redirect the additional rear speaker channels and stick to 5.1 surround in your main listening area. And a multi-room pre-output enables you to redirect audio and video signals to other rooms, too. Elsewhere, connectivity is very good, with assignable digital audio inputs and two HDMI input jacks. The video upconverters upgrade picture signals to the best quality available and even route analogue picture inputs via the HDMI jack. The onscreen menu system is unremarkable, but it does the job. There are plenty of options for fine-tuning the Marantz to your specific requirements once you've been through the lengthy setup procedure. Basic analogue signal upconversion and HDMI loop-through signals are expertly handled, with no significant degradation. Analogue video signals converted to HDMI digital don't look quite as good, however. 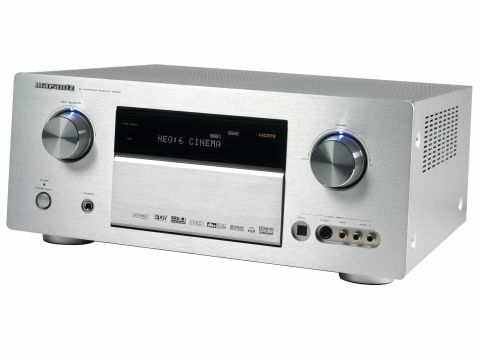 Audio-wise, the SR6001 performs just as brilliantly as the SR7001. Side by side, there's little to distinguish between the two, and despite the slightly lower total power output, the SR6001 has lots of drive and energy. Audyssey's setup procedure really does help make the surround sound performance as immersive as possible across a wide seating area, and in Casino Royale's high-octane action sequences, gunshots and explosive debris fly all around the room with tremendous clarity. The HT-EQ mode tempers higher frequencies in the event that a soundtrack becomes too strident. Music is handled with similar finesse. Select the Pure Direct mode and the amp switches off all unnecessary internal circuitry, including the front-panel display, for the cleanest audio signal possible.